After scanning for device compatibility and obtaining an email address, the app asks customers to choose from one of three prepaid plans. The flagship option is T-Mobile One Prepaid, a fully unlimited plan that costs $70 for 30 days. Simply Prepaid costs $40, but caps 4G data at 10 gigabytes. A $30 Tourist Plan, finally, includes a 1,000-minute ceiling on voice calls, a 2-gigabyte data cap, and a 21-day limit. Support for postpaid subscriptions is coming, T-Mobile said in its announcement. 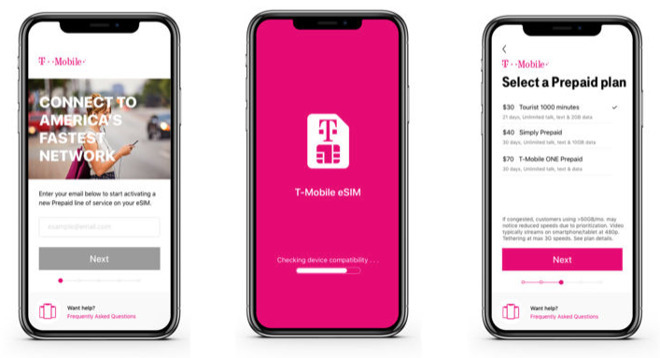 T-Mobile is the third major U.S. carrier to add eSIM compatibility, following in the footsteps of AT&T and Verizon. Sprint has promised to add the option, but hasn't set a firm date, which could mean it will have to wait for a merger with T-Mobile if plans aren't already well underway. iPhone owners must use a nano-SIM for their primary line, but eSIM lines can be particularly useful for people wanting to split work and personal calls, or traveling abroad. T-Mobile's Tourist Plan appears specifically aimed at iPhone owners from Europe and elsewhere who expect to spend a substantial amount of time in the U.S.